Smart card services supplier Infineer required a Belfast graphic design company to create a flier targeting the further education sector using a design style that portrayed the clients products and services in a sophistication way, to maximise the clients chances of effectively engaging school administrators, parents and purchasing departments in the this highly competitive marketplace. We led the graphic design of this flier with photographs depicting the end user (university students) accompanied by photos of the product, supported by large graphics of the clients product name ChipNet 3 (which we redesigned for this marketing campaign) to give an instant overview of the products benefits to target audience and the end user. 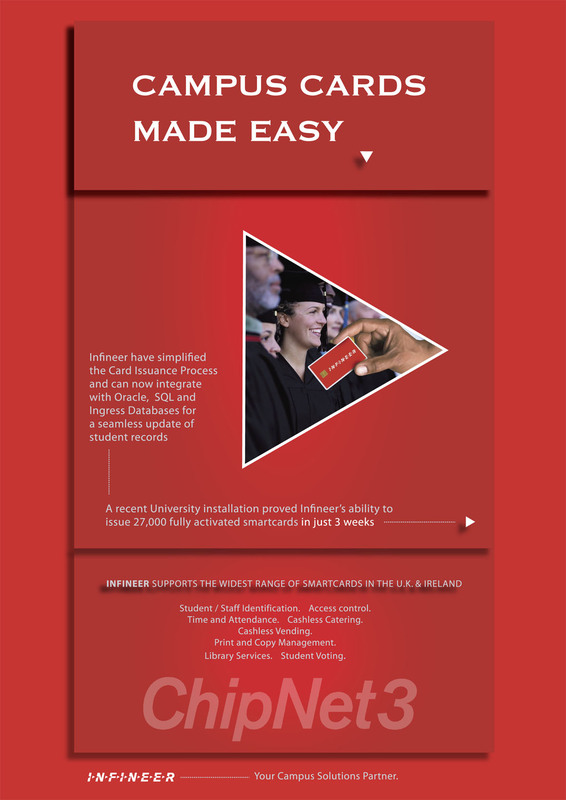 We supported this imagery with copy indicating the products ability to seamlessly integrate with the most modern systems software technology, and describing the quantity and speed of integration that the client previously delivered this product to a university client. The non-generic graphic design of this marketing collateral effectively supported the client’s successful tender applications to multiple universities, and other further education bodies, in both the Ireland and the UK. Scroll down this page to see a larger version of the final flier design.